Current procedural terminology (CPT) codes are used to designate services provided by healthcare professionals. As occupational therapists, we receive payment for our services depending on how we bill using these CPT codes. If we don’t properly bill for our services provided, we could be losing out on valuable income. This article aims to be a useful resource for new grads using occupational therapy CPT codes. No one chooses to enter occupational therapy for the money, but it is still a huge factor in how we provide our services. The payment we receive for our services is based on the resource-based relative value scale (RBRVS), which takes into consideration the work performed, the expense to the practice, and the liability and risk in providing the services or procedures. When I was in OT school, I learned only a little about proper billing and reimbursement. This is one of the topics that we are expected to learn on our own as during our Fieldworks and first jobs. As a new grad OT, it can take several months to navigate your way through proper billing procedures. You have to be ethical while trying to please both the insurance companies and your employer’s expectations. The language is vague on purpose. Those creating and modifying Medicare legislation and reimbursement know exactly what they are doing. Criteria for each CPT code must remain vague and undefined in order to give the insurance company the power to deny our claims if they feel our services aren’t necessary. Insurance companies don’t understand our role and the power of occupational therapy To them, if a patient is considered “functional”, they no longer require skilled occupational therapy intervention. When it comes down to it, insurance companies are businesses. They aren’t in the business to provide occupational therapy to everyone who needs it. They are looking to provide as few services as possible so they can make a profit. It’s nearly impossible for us to spend our valuable time and energy thinking that everyone who requires quality rehab and OT services will receive the necessary funding. Our time is better spent working with our clients, so we need to be as efficient as possible with our billing. We need to be informed of how to properly bill for our services to ensure small business success. We need our private practice clinics to thrive so that they may continue to serve our communities and the clients who need us. For reasons mentioned above and the vagueness of the reimbursement language, we must write a detailed description of our skilled interventions that fall under each billing code we use to get reimbursed. It is imperative we demonstrate our skilled therapy, since that justification acts as an argument for what we are doing. It’s important we demonstrate the high quality of care for our patients, and not for the sake of trying to receive as much money as possible. The truth is that we are underpaid for what we provide. We now have a masters or doctorate level of education. Let’s show the insurance companies how much we know and how valuable our skill set is. The main purpose of this article is to not only provide some insight on proper use of occupational therapy CPT codes, but to spark some motivation and eagerness on the topic among providers. I want us to air our frustrations and help each other understand the topic by providing personal accounts and information regarding what these codes mean and the criteria for which they should be utilized. With anything medical, there is always a jargon to understand. Here are some common phrases and terminology related to OT in order to understand how to use occupational therapy CPT codes. Untimed codes: The OT is paid a predetermined fee regardless of the time of treatment application. These codes can only be billed once per treatment session. The time spent providing these services cannot be included in your calculations of timed units and are considered separate billing codes. It is also important to remember that your evaluations are untimed. So if you can spend 10 minutes completing an evaluation instead of 24 minutes, you can use that other 14 minutes to bill another CPT code. Timed codes: These codes are based on the time spent one-on-one with the patient and include only skilled interventions. Time includes pre-treatment, actual treatment, and post treatment time. These are generally the interventions you are applying (versus the evaluation above). Pre-treatment time: Includes assessment and management, assessing patient progress, completing a char review, analyzing results, asking questions, and using clinical judgment to establish the day’s treatment. All of the contact time is administered by the OT or OTA. Intra-treatment time: This is the time spent providing a treatment. Post-treatment time: This includes analyzing and assessing the client’s response to your treatment, client and family education, documentation, or communicating on the client’s behalf to other healthcare professionals. The patient must be present during this period of time in order to include it in the time calculation. Rule of mixed remainders: This is where things tend to get confusing. Try this example: You just spent 24 minutes on treatment in which you billed 1 unit of self care and 1 unit of neuromuscular re-education. Now let’s say you spent an additional 7 minutes performing manual therapy and another 4 minutes using superficial modalities. According to Medicare guidelines (8-Minute Rule), you can combine this extra time (11 minutes total) into one additional unit of manual therapy since the sum of your remainders was more than 8 minutes (you bill for the service that you provided more of, hence, manual therapy in this case). Now that we’ve got some of the important details out of the way, let’s start talking about what I believe constitutes each of the used occupational therapy CPT codes. After poking around the Internet, it’s clear that there isn’t much information available. This information is based on my research and what I have learned from coworkers and Fieldwork educators in the past. Feel free to comment below to add your thoughts. Evaluations: Starting in 2018, there are now three different evaluation codes you can bill that include low complexity (97165), moderate complexity (97166), and high complexity (97167). Now, there isn’t much for guidelines out there. Be sure to check out the CPT coding book for details. My facility considers 1-3 deficits low, 3-5 moderate, and 5+ as complex. Therapeutic Exercise (97110): Includes exercises for strengthening, ROM, endurance, and flexibility and must be direct contact time with the patient. Functional mobility for ADLs or Mobility Related ADLs (MRADLs) are not included in here. Remember, differentiate yourself from other professions here and explain how the therapeutic exercise translates and will help your client with their ADLs. Neuromuscular Re-education (97112): Activities that facilitate re-education of movement, balance, posture, coordination, and proprioception/kinesthetic sense. You would include activities spent focusing on stabilization exercises, balance, desensitization, bearing weight through an affected extremity, etc. Manual Therapy (97140): Generally used when focusing on the upper extremity, OTs can bill this code when focusing on tissue mobilization, joint mobilizations, massage, and lymphatic drainage. Manual resistive exercise can be included in this category or in therapeutic exercise since it requires that resistance be applied by the therapist and may be performed with the goal of improving strength or endurance. Therapeutic Activities (97530): Includes “dynamic activities” that are designed to improve functional performance for ADLs. This may include functional mobility, bed mobility, step-ups/stair negotiation, throwing a ball, golf club, car transfer training, and high/low reaching. Self-Care (97535): I don’t need to explain this to you. This is our bread and butter. This training and improving performance in ADLs, working on compensatory strategies, using adaptive equipment, facilitating meal prep or self feeding, etc. You can also use this to educate clients and families on wound care, edema control, activity modification, improving home environment for safety, or transfers (getting on/off the toilet or in to shower). Cognitive Skills (97127): This is a new code. As of 2018, OTs can no longer bill 97352. 97127 is an untimed code for which OTs can only bill once a day. Medicare will also not reimburse 97127 but they have created a G code G0151 to help prevent fraud and abuse. Prosthetic Training (97761): Includes fitting and training in the use of prosthetic devices as well as assessment of the appropriate device, but does not include fabrication time. Fixed rate payers: Medicare and other insurance companies have a capped, daily amount for payment. So, this does not mean they will pay you the same amount no matter how much you bill. Be sure you bill for the certain (and correct) amount of time to reach the capped maximum payment. Be sure to bill for your services and nothing less, but NEVER bill for the time you did not spend with your client. Overusing certain codes: Not always, but insurance companies and others have been known to audit therapists who only use one billing code. If you are using one code more than another, they make ask you a few questions. To avoid this, be certain you are billing appropriately. For example, explain why and what you are doing that justifies neuro re-education versus therapeutic activity. Under-timing the treatment session: Be sure to understand the definitions of pre-treatment, intra-treatment, and post-treatment. Also, be sure to keep track of your time. Often you may guestimate you spent 35 minutes with a patient when in fact it was 39. Those four minutes can make a huge difference. Using the wrong codes: We sort of touched on this above, but make sure you are using the appropriate codes. Document correctly and be strong in your convictions. No one can argue the worth and value of OT better than you. You can almost always consider anything a therapeutic activity, but is it better suited as self-care or neuromuscular re-education? Just something to think about. What questions do you have about billing? Do you disagree with any of the information above? 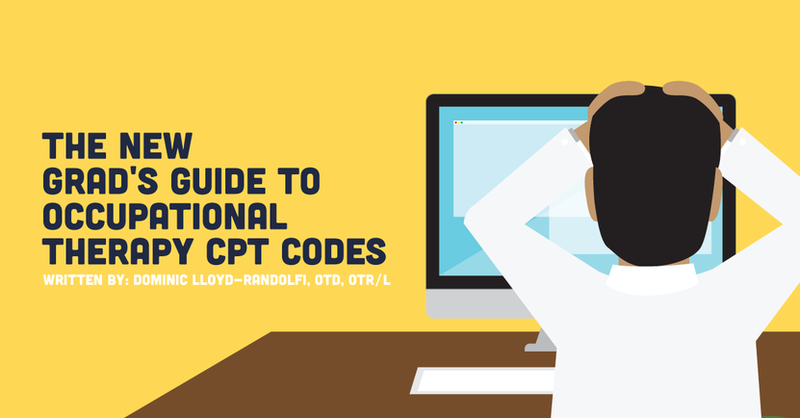 Would you like to further discuss how we should be using these occupational therapy CPT codes? Please comment below!